For Such A Time as This: Building our Prophetic Resistance, is an event sponsored by ISAIAH, a faith-based coalition of more than 100 member congregations that lets communities in Minnesota more effectively live out their faith in biblical justice and the common good. 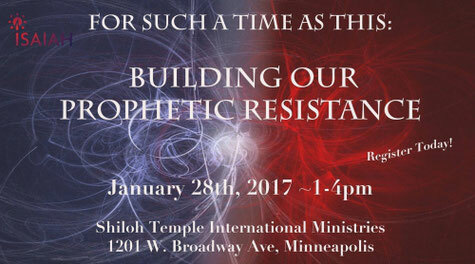 This event will take place at Shiloh Temple 1201 West Broadway, Minneapolis on Saturday, January 28th between 1:00 and 4:00 PM. If you are interested in attending please register at this URL: www.tinyurl.com/PropheticResistance or see Kathryn Kaatz, Nance Kent, or Eliot Howard at coffee hour. Please join other LHUCC friends at the home of Kathryn Kaatz (1321 Thomas Avenue North) following this event for snacks, good cheer, and to debrief what we have learned. Note: a large part of this event will cover the Sanctuary Church plans, however, other ISAIAH initiatives will be discussed as well. We hope to see you there!